The goalie is arguably the most important player on the field. They are responsible for keeping the other team from scoring, and the skills involved to become a successful goalie are quite different than the skills required to be a midfielder. That’s why we have focused goalie lacrosse camps. Through our camps, goalies will learn how to conquer blocking the ball with agility from some of the top players in the sport. No matter where you live, what gender you are, or how old you are, chances are there is a nearby lacrosse camp for goalies. We host many camps throughout the country at the top universities and high schools, with most of them taking place in June, July, and August. Each of these camps offers overnight and extended-day sessions and provides specialized clinics for goalies. During our goalie LAX camp, you will receive personal coaching and one-on-one evaluations to make sure you can master the skills you are having the most trouble with. Our lacrosse goalie camps are the most popular in the country for several reasons. First off, we have invested the time to find the very best coaches: coaches with actual goalie experience who know what they are talking about. The coaches at our goalie lacrosse camps know exactly what it takes to be a successful goalie, and they are excited to pass on their knowledge to you. Often, the goalie is the leader of the team, so our goalie LAX camps also put an emphasis on teaching this important skill. What’s more, our lacrosse goalie camp coaches are Double-Goal Certified by the Positive Coaching Alliance. So, in addition to helping you master goalie skills, they will teach you what it means to be a good person off the field as well. You will learn how to be a positive role model and how to live with integrity and character. Finally, we are one of the most popular lacrosse camps for goalies because we like to have fun. We encourage an atmosphere of healthy competition, and we provide ample opportunities to win prizes and awards. You will also make new friends and create lasting memories. In order to be a successful goalie, you need to have sheer dedication, unrivaled courage, unwavering focus, and effective communication. Oh, and you need to be really quick and have incredible coordination. 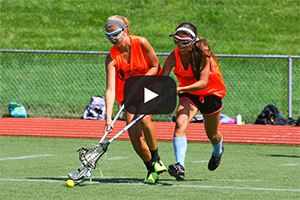 At our goalie LAX camp, you will learn all of this, and more. We have developed a unique progressive learning structure that results in a very high success rate. You will learn these skills in both group settings and in one-on-one coaching sessions to make sure that you are receiving specific coaching tips for your strengths and weaknesses. Our four-day immersive goalie lacrosse camps will make sure you learn all the skills you need to succeed. Are you ready to bring your goalie game to the next level? Are you prepared to crush the competition and become your team’s MVP? Then you need to sign up for one of our lacrosse goalie camps today. Our goalie lacrosse camps are the ideal opportunity for you to learn skills from the best goalies in the sport, and you won’t want to let the chance pass you by. So sign up for the goalie LAX camp nearest you today and be ready to have the time of your life while learning priceless tips to help you up your game.